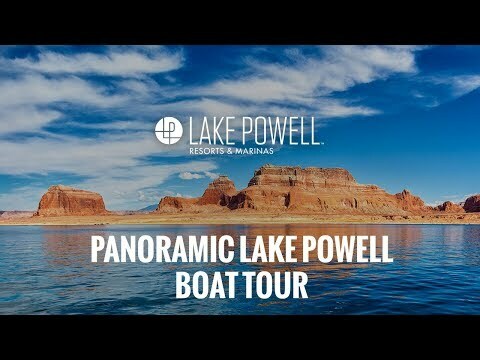 Panoramic Lake Powell Tour is a one-of-a-kind, destination tour that transplants you right into the dramatic backdrop and authentic majesty of our most beloved lake - Lake Powell. Take in the epic scenery and rich atmosphere of Gunsight Bay, where the pictures could practically take themselves. You won’t want to forget your camera because this tour is the best way to experience Lake Powell in its truest and most profound form. Visit spectacular Gunsight Bay and surrounding areas that are perfect for panoramic shots. Learn about the rich history and geology of the Lake Powell area from an interpretive guide during the tour. Unique opportunities for photos and videos to provide a lifetime of memories. The tour boat departs Lake Powell Resorts when the light is just right, which is typically around 5:00 pm. Water, coffee, and lemonade are available on all cruises. No food is available for purchase on board our cruises unless otherwise stated. We recommend you bring food and drink on board with you. NOTE: All boat tours depart from Wahweap Marina at Lake Powell Resort near Page, AZ. Be sure to arrive in the lobby of Lake Powell Resorts 30 minutes prior to departure. Boarding begins 15 minutes prior to scheduled departure time. Individual audio sets are included with every tour and are available in English, Spanish, German, French, Italian, Mandarin and Japanese. NOTE: There is a $30 Glen Canyon park fee that admits one single, private, non-commercial vehicle and all its passengers and is valid for 7 consecutive days. The funds collected from entrance fees stay within the park and are used to enhance the experience of visiting the lake. To learn more about the park fee visit the National Park Service website. NOTE: This tour lasts approximately 2 hours. Due to fluctuating water levels and whether or not "the Castle Rock Cut" is open, this tour may take longer than planned. The winter tours will run if there is a minimum of 15 passengers booked on the trip 48 hours prior to departure. Please call 928.645.2433 within 48 hours prior to your scheduled departure to check on the trip status. Full payment for tour will be processed at time of booking. Tour seats must be cancelled 24 hours prior to tour departure in order to receive a full refund. Cancelling within 24 hours of tour departure will forfeit the value of the tickets. All cruises are subject to cancellation or consolidation by management at 24 hours prior. To confirm your departure please call 24 hours in advance of your booking. Smoking is NOT permitted while onboard.